When it comes to acne (the clogging of the skin's pores with oil), not all bumps are created equal. There are whiteheads, blackheads, pimples and the topic of this article--papules. What makes papules different from the rest? Papules are lesions that are small in size and tend to be pink in color. Because a person tends to have numerous papules on the face, they can be especially troublesome to treat. Papules are tiny bumps on the face that tend to be 5mm or less in size. A papule occurs when a hair follicle becomes inflamed--this is different from other acne occurrences such as whiteheads or blackheads, as these are caused by sebum blockages. This inflammation can come as the result of sweating and friction to the skin; as a reaction to extreme heat or medications; or even due to a genetic predisposition toward forming papules. These bumps are often raised above the skin, but may be flesh-colored and only noticeable by touch. Although most dermatologists do not recommend squeezing acne bumps of any kind, papules are one type of acne in which it will do little good to squeeze or pop. In fact, doing so could cause irreversible scarring. Because the papules are the result of inflammation, these often is little pus or sebum inside the papules, making it off little use to pop. Instead, applying a warm compress to the face may help to reduce papules. The treatment of papules begins with a good daily skincare regimen, all with a goal of reducing inflammation. This means washing the face twice daily with a mild face wash and applying a topical agent to help reduce acne, such as 2.5 percent benzoyl peroxide or a salicylic acid gel. Applying a daily sunscreen with a sun protection factor (SPF) higher than 15 also may help to reduce the chances for inflammation. Additional prescription medications may be recommended by a dermatologist for the treatment of papules. Especially beneficial are topical antibiotics, such as clindamycin or erthromycin, both of which kill bacteria in order to reduce inflammation. Additional treatments include retinoids--such as Retin-A, Differin or Tazorac--which are helpful in reducing inflammatory acne. It also is possible to take antibiotics in pill form--such as doxycycline, minocycline or tetracycline. 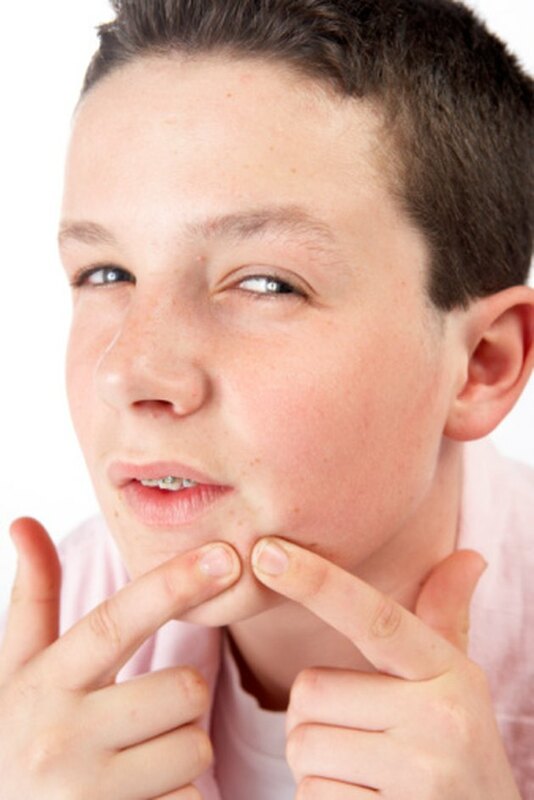 Acne papules may take several months of treatment in order to completely subside. This is especially true for those utilizing antibiotic medications as the medications may cause initial breakouts, then the skin clears as a result. Acne papule treatment takes time in order to see success; staying committed to treatment applications or medications is vital to your success.